IAAN Creation Pvt. 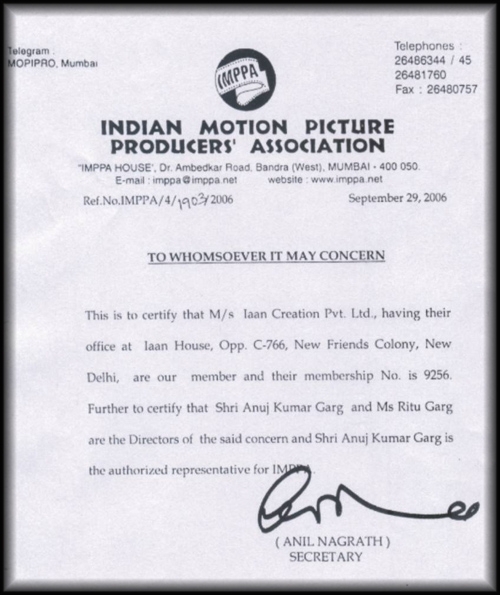 Ltd. is a proud member of the Indian Motion Picture Producer's Association, Mumbai since 2006. The Indian Motion Pictures Association (IMPA) is the first and only internationally recognised oldest association of the Indian Film Production Sector. IAAN Creation Pvt Ltd. is actively involved in producing both documentaries and feature films. It has fully equipped editing and shooting studios . 	Documentary film on “Nainital"
	Documentary film on “Tourism in Rajasthan"
	Documentary film on “Jim Corbett National Park"